Quarterback Alex Smith played brilliantly on Saturday, especially in the first half as the Chiefs built a 31-10 lead. Overall, Smith threw for 378 yards and a Chiefs' playoff-record four touchdowns. KANSAS CITY, Mo. 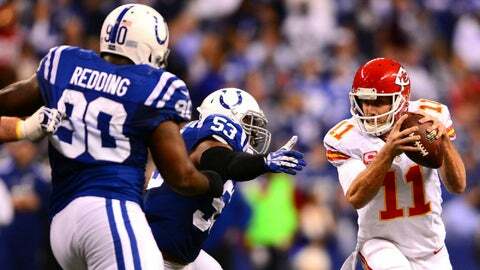 — Five things we learned from the Chiefs’ horrific meltdown in a 45-44 playoff loss to the Colts. Hey, kids, pop quiz for you: Which defense was more pathetic — the Greg Robinson crew from the 2003 season that didn’t force a punt in the 38-31 playoff loss to the Colts (Robinson got fired after that unsightly effort), or Bob Sutton’s defense on Saturday? Believe it or not, the answer is: Sutton’s sad sack of defenders. Robinson’s defense gave up 434 yards to Peyton Manning. Sutton’s crew gave up a whopping 536 yards to Andrew Luck and Co. That’s not a typo — 536. That is historically bad. In fact, it is the fourth-worst performance in the entire history of the Chiefs. The worst was the 563 yards that the 1990 Chiefs gave up to the run-and-shoot Warren Moon-led Houston Oilers. Granted, the Chiefs did force four turnovers Saturday. Thank heavens for that. If not for those turnovers, the Colts might have put up 700 yards of offense and 70 points. It was truly that bad. The Chiefs defense, which did lose cornerback Brandon Flowers in the second half and then linebacker Justin Houston late, were otherwise healthy. But the defense could not protect a 38-10 second-half lead. Why? Well, it was a combination of virtually no pass rush — Luck was sacked just once — and some of the worst secondary coverage you will ever see at any level of football. Cornerback Dunta Robinson played 10 to 15 yards off the receivers on virtually every snap — not an exaggeration — and was beaten on every ball targeted toward him. He was beaten most often by T.Y. Hilton, who had 13 catches for 224 yards. Cornerback Sean Smith was no better and also was routinely picked on. Smith, in fact, gave up the 46-yard completion to Colts rookie Da’Rick Rogers, recently promoted from the practice squad, a play that sparked the Colts comeback. Five different Colts receivers caught passes for a total of 40 or more yards as Luck threw for 443. The same crossing routes that befuddled Sutton’s defense during the first meeting at Arrowhead again completely baffled the Chiefs’ secondary. Sure, you’d like to give credit to Luck, and I’m sure the national media will blow kisses his way for days. But then again, it would have been hard for any NFL quarterback to miss such wide-open targets, including the game-winner, a 64-yard bomb to Hilton who was 10 yards past the closest Chiefs defender (Quintin Demps). Andy Reid should be coach of the year in the NFL for getting this team to the playoffs, and the Chiefs are damn lucky to have him. But one of the complaints about Reid in Philadelphia was his inability to manage the clock. And that popped up again at a crucial time Saturday. Quarterback Alex Smith seemed frustrated when twice on the same drive in the fourth quarter he had to burn timeouts, presumably because the play didn’t get in fast enough. And then, with the game on the line coming out of the two-minute warning, the Chiefs again had to burn a timeout, their final one. That meant that the Chiefs’ fourth-and-11 play was truly their final hope. If the Chiefs’ hadn’t had to burn all their timeouts, they conceivably could have gotten one more chance in the final minute, though it seems unlikely their ridiculously bad defense could have stopped the Colts. No, Dwayne Bowe did not come down with a circus catch on the sideline on the Chiefs’ final play, thus ending their chances and their season. His right foot came down just inches from being inbounds. But Bowe, who pronounced before the game that big-time players such as him show up for big-time games (and I apologize, Dwayne, for poking fun at you for that), certainly stepped up. Bowe caught eight passes for 150 yards and a touchdown. And almost every catch he made was tightly contested and in heavy traffic. Bowe, at 221 pounds, also broke tackles and was much too physical for the Colts. Fantastic game for the Bowe Show. Hopefully there is no whining in the Chiefs kingdom about quarterback Alex Smith’s play. No, Smith did not engineer the game-winning drive. And yes, his last throw should have been a hair more toward the field of play. But Smith played brilliantly, especially in the first half as the Chiefs built a 31-10 lead. Overall, Smith threw for 378 yards and a Chiefs’ playoff-record four touchdowns. Smith also played fearlessly, sacrificing his body on several read-option runs and scrambles. He wound up with 57 yards rushing. And Smith helped the Chiefs put up over 500 yards of offense, despite the fact that he only had Jamaal Charles for roughly three minutes of the game before Charles left with a concussion. Smith also had to work without speedy wideout Donnie Avery, and then he lost Charles’ backup, Knile Davis, in the fourth quarter. Losing Davis really condensed the playbook and, in fact, may have cost the Chiefs the game. Smith missed a wide open Cyrus Gray with an overthrow on a wheel route that the speedier Davis likely would have run down and caught for a touchdown. You can follow Jeffrey Flanagan on Twitter (@jflanagankc) or email jeffreyflanagan6@gmail.com.